​The duo were nominated in the 2017 BBC Radio 2 Folk Award ‘Horizon’ category for Best Emerging Artist and also for ‘Best Duo’ in both the Fatea Magazine Awards 2016 and the Folking.com awards of 2017. In March 2017, the duo were invited to perform a live session on Mark Radcliffe’s BBC Radio 2 Folk Show, where the presenter described their singing as ‘A rather lovely thing…like two halves of one voice’. 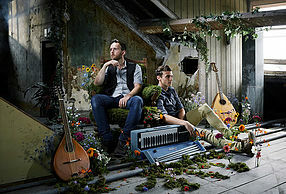 Most recently, Ninebarrow’s second album, ‘Releasing the Leaves’, was released to wide-spread critical acclaim. Recorded and produced in the duo’s own studio and mastered by Mark Tucker (whose other credits include Show of Hands and Fairport Convention) the album received a raft of stellar reviews including five stars in both Maverick Magazine and the English Dance and Song Magazine produced by the EFDSS. Receiving airplay on national and regional radio stations across the UK, including the multiple plays on the BBC Radio 2 Folk Show, it was described by Suzi Klein on BBC Radio 3 as demonstrating the duo’s harmonies ‘to perfection’. It was also awarded four stars by The Telegraph and listed in the paper’s Top Folk Albums of 2016 as well as featuring in several other ‘Best Albums of 2016’ awards lists.